Our current society has entered into a sort of golden age for social media. While this phenomenon is a major part of our daily lives, the ramifications for such socialization often goes unrecognized. This can be especially true for families who are going through the adoption process. Whether you’re adopting a baby or you are making a selfless sacrifice and giving your child up for adoption, the ramifications of social media use can be far-reaching. A is 4 Adoption is here to help all parties involved with the best services available. Unlike your typical adoption agency in California, our organization works through private adoption to place more children in need into more loving families. Our goal of making this complex process easier while reducing the stress of everyone involved has helped to make us a top choice. 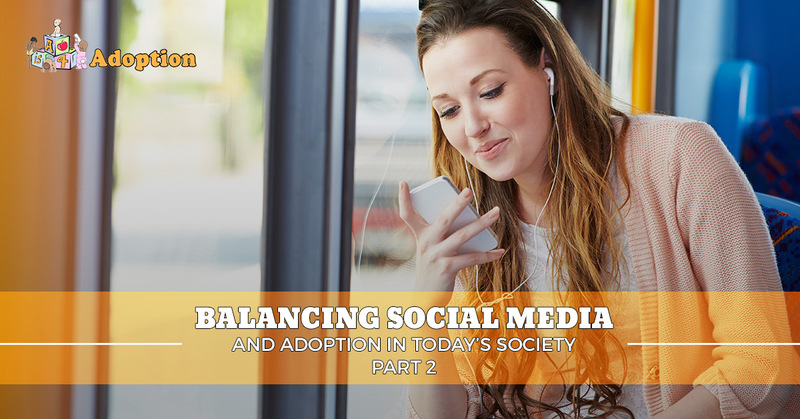 While our last blog focused on a few common benefits and negatives of social media with adoption, today’s installment will look more at recommendations to help at different stages of the adoption process. Taking the proper precautions will assist you in maintaining a positive relationship with the birth parents or adoptive parents. Working together to create an optimal environment for the child is why we’re doing this in the first place! Prior to the big day arriving, both parties will be in a delicate state of communication. To start, one of the most important actions you can take is discussing communications with the other party with your significant other. If he or she is not interested in fostering such a relationship, it would be much better to know now as opposed to afterwards when everything has been done. Once your partner has consented to contact via social media, it would be recommended to speak with the entity that is representing you during this process. Whether you’re using an adoption agency or an advocate such as ourselves,it’s considered best practice to loop in the professionals. A is 4 Adoption, for example, will have the experience and education needed to navigate this sensitive subject. No matter who you adopt through, be sure to loop them in on our intentions for correspondence through social media platforms. While social media is an exciting method of communicating with the birth family or expectant adoptive parents, its ease and sudden delivery can create a stressful environment for developing a new relationship. We recommend meeting your other family through a more traditional means of contact, whether it’s via telephone or even in person. Your nationally-recognized adoption center can assist during this process. Families who are new to social media should take the time to learn all of the functions and intricacies of the programs. The privacy settings, in particular, can help to make or break your relationship with the adoptive or biological family. A common issue people run into today when unclear on their platform’s functions is whether or not their message or post is private. Learning about these functions can help to prevent many headaches in the future. Conversely, individuals who are currently active on social media should be cognisant of their posts and messages in regards to how other people may feel about their profile. If your page is littered with pro-gun messages or religious posts, for example, it would be best to limit what non-friends and family can see. This way, you can avoid any judgments or complications in the adoption process. Be sure to use discretion on what posts you place online concerning your progress in the adoption process. One mistake many prospective parents make during this stage is announcing the progress of receiving their child. If something is to go awry, the adoption plan may be canceled, causing heartache in a public forum. Additionally, birth families may be able to keep up on these updates, which if done incorrectly can cause a lot of damage. When in doubt, be cautious! Posting about your adoption can also be harmful if private information about the other family is disclosed online. Privacy is a top concern in the adoption field, and social media can be one tool that does more harm than good. Commenting about your child and their biological family makes the information public, giving anyone with internet access the ability to disclose and disseminate this info at will. While being open with your child about their adoption is a positive practice, learning about the truth from a stranger before the parents are ready can be very damaging. The world of social media has made communication easier than ever before. Unfortunately, individuals who are currently going through the adoption process can suffer from this ease of obtaining information. Next time, we’ll look at some guidelines that can guide you for social media use once a match has been made and plans are in place to complete the adoption. Anyone considering undergoing this selfless act of love can benefit from working through A is 4 Adoption. Our experts provide full support for adoptive parents and birth mother help to ensure that the baby is placed in the most loving home possible. Anyone looking to adopt will be surprised that our organization is actually not an adoption agency in California. By working closely with all parties, we are able to cut through much of the waiting times that parents and children have to suffer through. Whether you’re a birth mother seeking an amazing choice for their child or a family looking to grow, feel free to contact us today to learn more!